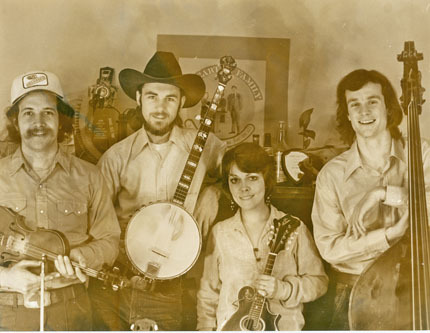 From 1970 to 1983, the Hotmud Family traveled the highways, low roads, backwaters and mountaintops of America, playing traditional country music in taverns, clubs, festivals and concert halls. In the fall of 2010, the band reunited for a series of performances to celebrate the first digital release of their original recordings, made in Cincinnati in the 1970s for the Vetco label. Might as well get this out right up front: I’m not what you would call “an unbiased observer” of this tale. The Hotmud Family was, is and probably always will be my all-time favorite bluegrass/old-time country music stringband. From the first time I saw them, in 1969, even before they were a proper band, to the official “last concert” in 1984, I saw hundreds of Hotmud Family shows, at festivals, hole-in-the-wall honky-tonks, colleges and plush theaters. I was a fan. The Complete Vetco Recordings documents an especially fertile five-year period 1974-1978) during which the Hotmud Family recorded the four Vetco albums reissued here— …til we meet here again or above (Vetco 501), Stone Mountain Wobble (503), buckeyes in the briar patch (507) and Years in the Making (513)— and a single (Redleg Rag/Old Songs), as well as a pair of Vetco records on which it backed Fiddlin’Van Kidwell, an award-winning old-time fiddler originally from Madison County, Kentucky, Fiddlin’ Van Kidwell with the Hotmud Family (502) and Midnight Ride (506). Vetco Records, a Cincinnati label started in the late 1960s by Lou Ukelson, was housed in the Jimmie Skinner Music Center on Vine Street. 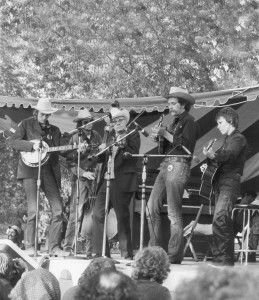 The label started out with some old-time music reissues, but it became better known for its albums by young Ohio bands like the Hotmud Family, Hutchison Brothers, Falls City Ramblers and Katie Laur Band and by older mainstream bluegrass artists like Mac Wiseman, Charlie Moore, Earl Taylor, Jim McCall and Paul “Moon” Mullins. The story of the Hotmud Family began in the late 1960s when three young musicians—Suzanne Thomas, Rick Good and Dave Edmundson—from Dayton, Ohio, joined forces to play the old-time country music songs and tunes they loved. All three had come up through the folk scene, but now wanted to dig deeper into the country music of the 1920s and 1930s. 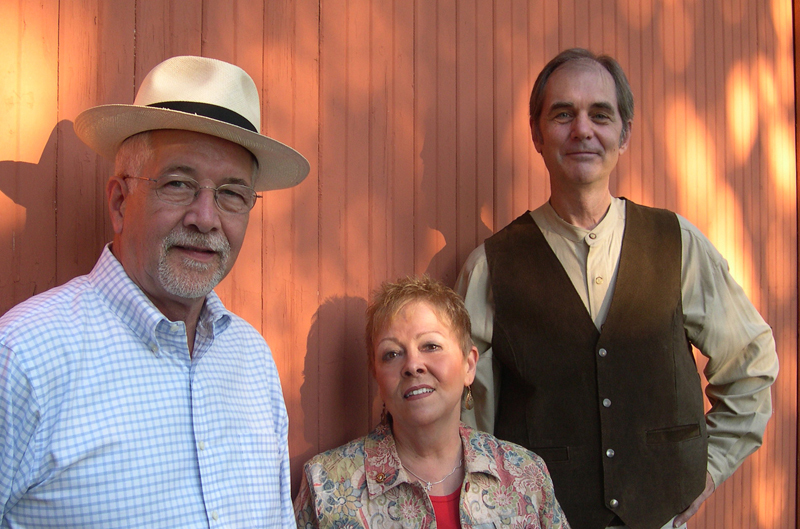 Inspired by the New Lost City Ramblers, Suzanne, Rick and Dave began searching out and learning from old records by such pre-World War II country artists as the Carter Family, Uncle Dave Macon, Jimmie Rodgers, the Delmore Brothers, the Skillet Lickers and Mainer’s Mountaineers. The band’s name was pure 1969. When they had reached that inevitable point in time when a group of pickers becomes a band and needs a name, Suzanne, Rick and Dave were playing with another musician, Michael Hitchcock. They knew they wanted to be the Something Family, because they liked the idea and sound of Family, but the something-part was troublesome. Finally, Hitchcock suggested a name based on the elements associated with the four members’ astrological signs (remember, it was 1969), which included fire, earth and water. And what do you get when you combine fire, earth and water? You get, that’s right, hot mud. 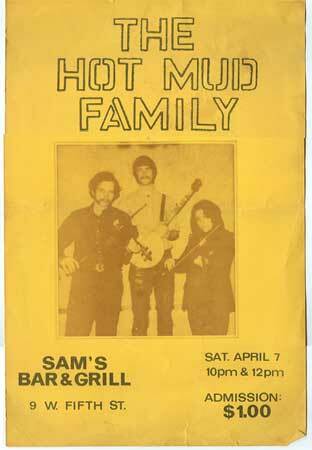 The Hotmud Family had its breakthrough year in 1974, a busy year for the band by any standard. Suzanne, Rick and Dave recorded the first two Hotmud albums for Vetco, …til we meet here again or above (with guests Ron Murphy, bass, Greg Dearth, fiddle, and Tom Harley Campbell, spoons) and Stone Mountain Wobble (with guests Van Kidwell, fiddle; Tom “Peach” Hampton, mandolin; George Zimmerman, piano; and Mr. Spoons, aka Joseph Jones, a unique individual who always reminded me of a character in a Flannery O’Connor story. 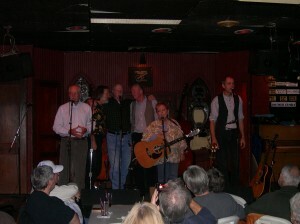 The Muds also backed their friend Van Kidwell on his album, Fiddlin’ Van Kidwell with the Hotmud Family. …til we meet here again or above introduced the Hotmud Family to the world outside southwestern Ohio. 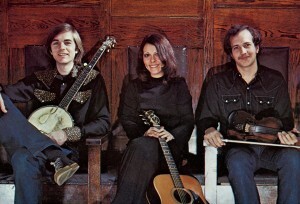 In later years, Suzanne, Rick and Dave would settle on “their” instruments, but at this point, they all played a bit of everything: Suzanne played guitar, mandolin, banjo, autoharp, banjo-mandolin and piano; Rick played banjo, steel guitar, banjo-guitar and guitar; and Dave played mandolin, fiddle and guitar. The trio displayed its impressive instrumental chops on such killer old-time tunes Last Chance , John Lover’s Gone, Shuffle Creek (written by and featuring fiddler Greg Dearth of the Hutchison Brothers) and the sparkling banjo/fiddle duet Polly Put the Kettle On. Order your 2-CD set today – 55 tracks with a full color, 20 page booklet. I have been singing since I could talk and have been playing music since the age of not-quite-five, when my dad, a talented horn player and Big Band arranger, brought home and refinished an old Knabe upright piano. Though my parents tried to teach me culture and saw to it that I had a broad musical education, I was always drawn to the old time country music of their roots, which they had assiduously striven to overcome. They got my brother a 4-string guitar when he was twelve and I was fifteen. He had no interested in the guitar and I immediately co-opted it. I got a 6-string when I was eighteen, learned some chords and started performing during the “folk scare” of the mid-1960’s. I dropped out of college and went on the road, alone, at nineteen, working steadily as a solo performer until 1970, when I met Dave Edmundson and Rick Good and we founded the Hotmud Family. Our goal was simply to be “the Best Band Ever,” which we worked at full-time until about 1984. One of the primary tenets of the band (which is still my personal musical credo) was to learn only songs we loved. This turned out to be a really good decision. Over the years we were joined by some great musicians as band mates. In chronological order they were: Tom Harley Campbell, Tom McCreesh, Jerry Ray Weinert, Gary Hopkins, Lisa Ornstein, T.J. Lundy and Greg Dearth. Rick, Dave and I were there for the duration. We all pursued different creative endeavors after 1984, regrouping for occasional gigs until what we thought was our final gig ever, December 31, 1989, at the Polish Club in Dayton, Ohio. That’s when we finally went our separate ways for good, until of course the amazing 2010, Reunion with a capital “R” brought us back together after more than twenty years. I was also half of a duo called the Kentucky Warblers with the wonderful singer/songwriter Carol Elizabeth Jones. We had some great musical experiences, including a tour for the USIA to Southeast Asia, during which we played Old Time Music in Thailand, Indonesia, Singapore, Malaysia and Brunei (we were the first American performers to ever appear in Brunei). In 1991, I married Gary Hopkins, my best friend and favorite bass player (sorry, Harley and Jerry Ray!) and a few years later we took the first steps on the path we are now eagerly following. We committed our lives to Christ and resolved to go wherever God tells us to go (sort of a “Children, Go Where I Send Thee” in real life/modern times thing). We live on a small farm in Highland County, Ohio where we are involved in ministry, Gary as a Pastor and prison minister, and me in music ministry. We have two horses, three dogs and an embarrassing number of cats. For the last ten years I’ve been employed full-time as Executive Director of the Highland County Senior Center, a hangout for active older folks (OMG, I’m one of them!) and am involved in Rotary, write two weekly local newspaper columns and serve on the boards of some community organizations. I’ve been on the Worship Team (church jargon for “band”) of the various churches with which we’ve been associated as Gary pursues his credentials as a licensed local pastor. Lucky for me, I really like contemporary Christian music. To sum up: I am NOT a diva. I myself am not especially interesting, although I have had more than my share of interesting experiences and had the opportunity to meet and work with more than my share of interesting and talented people. I am just very, very blessed. Life after Hotmud includes nearly six years as a member of the Dry Branch Fire Squad, followed by twenty years or so playing in groups like the Lazy Boys, the Side Cars, and lately the OK Ramblers (I think the So-So Ramblers was taken.) All the while I have been married to Beth Sullebarger (a consultant in historic architecture), teaching English at a vocational school in southwest Ohio, living in and around Cincinnati, fixing up a house or two, learning to play the tenor banjo. (Those familiar with the current world of Old Time Music can imagine the warmth of possible answers to the question, “Mind if I join your jam with my tenor banjo?”) If the gummint doesn’t screw things up too badly, I should retire sometime soon and start looking for work outside the high-school-English racket. I was nineteen years old when Dave, Suzanne and I started playing together as the Hotmud Family. Upon hearing the band play at a Halloween party, my faculty advisor from college suggested I drop out and focus on music. Fourteen years later, when the Muds disbanded, I became a thespian with the Mad River Theater Works and spent four years traveling around Ohio performing original plays, including Tommy Thompson’s, “The Last Song of John Proffit.” In 1987, my partner in life and art, Sharon Leahy and I began directing the dance and music company, Rhythm in Shoes. For the next twenty-three years we toured the states (all but two) and various foreign countries with twelve to seventeen performers, concertizing and collaborating. These days, Sharon and I play together in our new group, ShoeFly, and I continue to moonlight whenever I can with the Red Clay Ramblers. That adds up to forty years of making my living as a banjo player, all without the benefit a college education! These days I’m the only Mudhopper still in Spring Valley. It’s where Sharon and I raised our blended family of five kids, Ben Cooper, Nate Cooper, Cassie Good, Canaan Good and Emma Young. They’re all grown now and we have grandchildren playing in the yard. It’s a beautiful thing. I was a Mud for 2.5 years, from spring of ’74 until fall of ’76. For a short while after that I was a counselor at the Montgomery County Juvenile Detention Center (basically a prison guard for kids). I left Ohio the following summer and moved to New York State. From the fall of 1977, through the spring of 1981, I played with Walt Michael and Tom McCreesh as Michael, McCreesh & Campbell. We recorded two albums for the Front Hall label. Highlights for that band included several European tours and collaborations with Pilobolus Dance Theater (we created the soundtrack for one of their signature ensemble pieces called “Molly’s Not Dead,” the title coming from the bluegrass standard, “Mother’s Not Dead,” with my Mom’s name substituted for “Mother”). We also performed at the closing ceremonies of the Lake Placid Winter Olympics in 1980. During this time I lived in different places in upstate NY including Schenectady, Altamont, Poughquag, and High Falls. Also during this time I did a little studio work, playing bass on several recording projects including one for the Fiction Brothers and one for Hazel Dickens. In the summer of 1981, having left M, Mc, & C, I moved to Mecklenburg NY (near Ithaca) and the following year married Annie Cook. I have two step-children with Annie, son Storn and daughter Cody. Annie and I live on a farmette in an old Greek revival farmhouse. Over the years I have been a machinist, house painter, carpenter and builder. Somewhere in there, for about 6 years, I spent a lot of time writing songs, going back and forth from Ithaca to Nashville. This included a two year period as a staff songwriter for Forerunner Music, with limited success. For the past five years I have been a licensed New York State home inspector. When I first came to the Finger Lakes area, Annie and I were in a little dance band called the Razorlickers (ouch). Annie plays fiddle and snare drum and over the years, we have played for dances in several old-time pick up bands, and still do an occasional gig with the Grey Sky Boys. For the past five years we have been members of Toivo, playing mostly Finnish, Tex/Mex and original dance music. I was a Mudder from ’75 to ’76. Prior to that, I was a founding member of Fennig’s All Star String Band, recording for Front Hall Records. After that, as Harley Campbell notes, we played together for a number of years as Michael, McCreesh & Campbell. Highlights include playing a show for my relatives in Ireland and also the 1980 Olympics. My parents emigrated from the Emerald Isle. Hence, my Irish music background which I consider my “soul” music. 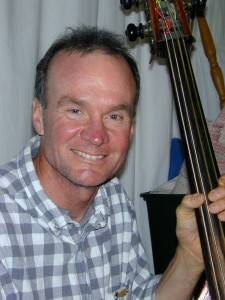 I learned to play in Public school but it wasn’t until Graduate school that I began playing professionally with Fennig’s, an Irish/contra dance band. Six years later, I joined the Hotmud Family and there the education began. My musical life was greatly enriched. I soon felt as if I were now qualified to take a Ph.d in American Music. For this rare opportunity I grow more grateful as time passes. I played as a solo between bands. 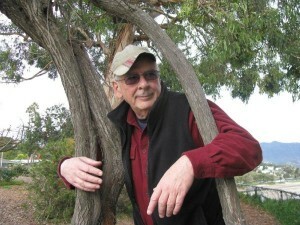 In 1982, Nan, my wife of thirty-five years, and I moved to Santa Barbara where I played in a Bluegrass band. In ’85 we moved to beautiful Oregon, where I returned to teaching full time. We then returned East to do another Masters, this time in Special Education, which allowed us to live and teach in a neat little town on the Oregon coast. Nan and I are now retired and continue to enjoy living (and fishing) in Florence, Oregon. I play regularly with my band, The Usual Suspects. We have been banging out good tunes for over twenty years. Go Ducks! 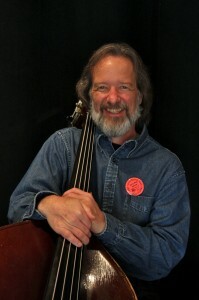 I played and sang bass with the Muds for three years, from September 1976, through September 1979, appearing on the Vetco LP, “Years in the Making” and the Flying Fish LP, “Live, As We Know It.” When I left the band to take advantage of an education paid by the GI Bill, I went from bluegrass to bedpans and have worked as a Registered Nurse ever since. Currently, I live with my wife, Marni Dittmar, in Tucson, Arizona where I work for the Udall Law Firm as a Nurse Consultant. Since my Hotmud Family days, I’ve continued to play music with a variety of bands. While in North Carolina, I played and recorded with The Red Hots. I was also a member of the Blue Ridge Serenaders and the Carolina Night Crawlers. Soon after moving to Arizona, I joined The Privy Tippers, a string band based in Tucson, and recorded a couple CDs. I also joined the Central California based band, For Old Times’ Sake and recorded another CD with them. Now-a-days my traveling is mostly up and down the left coast, spreading the joy of traditional music and sharing it with my many wonderful friends. Born in the State of Shock (actually southern Ohio), I received for Christmas at age 4, a cowboy hat, cap gun, ukulele and a tricycle. 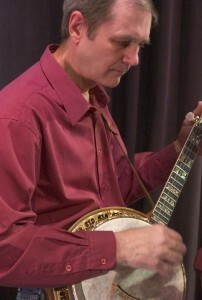 I’m still playing uke, as well as banjo, guitar, mandolin, basses, trumpet, tuba, and euphonium, mostly in church. I’m also still riding horses and motorcycles and, on some days, still shooting guns. Growing up with relatives and family friends who played string band music (fiddle, guitar, mandolin and banjo), I started performing at age 14. I enjoyed concert and marching band in high school and played through college and the US Air Force. After working as a road brakeman and road freight conductor with the Norfolk and Western Railroad from 1973 to 1979, I joined the Hotmud Family in October of 1979, and worked until the end of our run in the fall of 1983. Currently, I am the Music Education Coordinator and School Service Representative for a major music retailer in Southwest Ohio. I am also assigned as associate pastor to the Staunton United Methodist Church and the Sugar Grove UMC in Fayette County, Ohio and have become deeply involved with prison and jail ministry. I also serve as Chaplain for the Southern Hills Chapter of Bikers for Christ. My wife, Suzanne Thomas and I are celebrating twenty years together and living peacefully on a small farmette in Southwest Ohio. Between us we have three grown children (one of each), Mimi, Amos and Andy. All of them are professional performers. Our first grandchild is expected to arrive in February, 2011. This February and March, 2011, I will be going on mission to Vietnam, traveling by motorcycle from Hanoi to Ho Che Minh City (Saigon) and covering approximately 1,000 miles with other missionaries from the UMC. We will be holding Christian religious services, working on remote churches, building water wells, etc. My favorite hobby is vegetable and fruit gardening (closely followed by raising animals). My favorite foods are meat and potatoes and stuff like that. My favorite record is “Meat and Potatoes and Stuff Like That.” My favorite way to relax is enjoying a good, quality cigar with good friends on special occasions. I enjoy nearly all musical styles. My favorite song is “When I Wake Up To Sleep No More.” My favorite musicians… I like them all. My motto is, “Keep your socks dry and your knife sharp!” (I learned this from an Errol Flynn movie, “Objective Burma.”) I will probably never get to retire but I really don’t want to anyway. Van Kidwell’s original Vetco LPs, recorded with the Hotmud Family in 1974 & 1975, have been reissued and are available through the Field Recorders’ Collective, under the title, Fiddlin’ Van Kidwell, FRC412.